(Front row l-r) Mr. Noral Lescott [rep. the Golden Rock Hotel], Mr. and Mrs. Oscar Walters [Ole House Café], Premier and Minister of Tourism the Hon. Joseph Parry, Ms. Omel Wilkin, Mrs. Nicole Johnson [rep. Jim Johnson’s Pirate Week], Ms. Elsa Delashley. (Back row l-r) Mr. Everette Martin [rep. the Bank of Nevis], Mr. Winston Crooke, Mr. Nick Menon [rep. British Airways] and Mr. Cartwright Farrell [rep. NEVLEC]. NIA – CHARLESTOWN, NEVIS (November 30TH, 2010) — As rain poured from the evening sky, so did applause pour from the nominees and supporters who assembled at the Golden Rock Hotel on Nov. 22 for the first ever Hotel and Tourism Association [HTA] awards ceremony and cocktail party. The entire event appeared to be stone-centered; from the stone buildings that make up the historic venue to the stone-sculpted, three-faced trophies that depicted the faces of tourism. The three faces of tourism as explained by HTA Director Mr. Greg Phillip, are the significant aspects of Nevis’ tourism sector. They are the community, the tourists and the workers. The full service global airline that “provides a major link to the European market, British Airways, outshone Winair and thus, captured the first award of the evening; the Best Airline Partner award. “Minus airlift, tourism on Nevis will be vastly different than it is now, in fact, the industry would struggle to provide the benefits it contributes to the economy,” Mr. Phillip said as he explained the reason for awarding an airline at the ceremony. 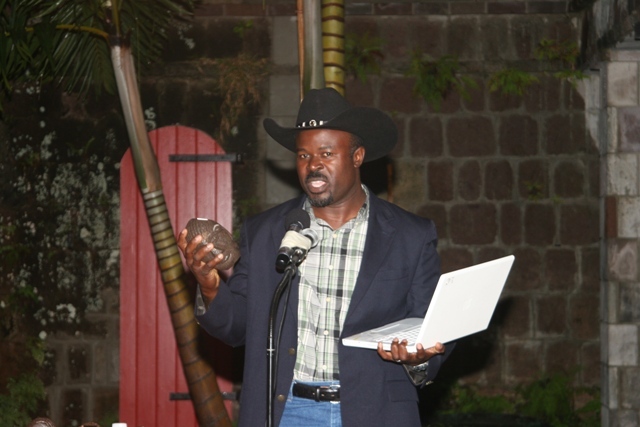 Director of the Hotel and Tourism Association Mr. Greg Phillip holding a stone award carved by Mr. Marvin Chapman. NEVLEC, known as the electricity company “that has been resilient in times of disaster” won the prestigious award which was humbly accepted by the company’s General Manager Mr. Cartwright Farrell. While the works of LIME employee Mr. Caldrey Farrell and taxi driver Mr. Calvin Ward received recognition, it was Ms. Omel Wilkin’s bright smile coupled with “the impact of her work at the Vance W. Amory International Airport” that won her the award for Service Employee of the Year. 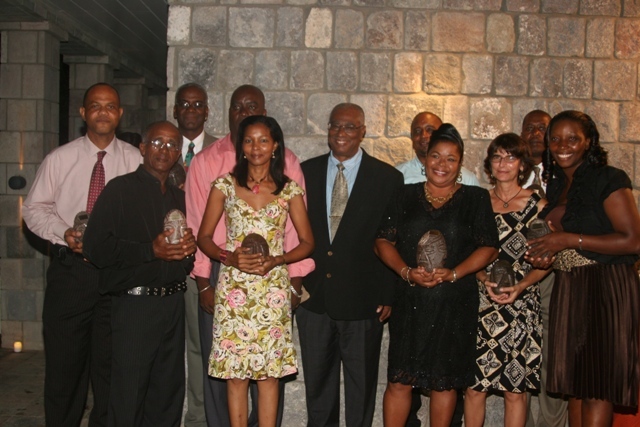 As he introduced the nominees for the Sports Tourism Award, Director Phillip commented on the “relentless and selfless dedication” that Nevisians put into ensuring the existence of annual sporting events. Mr. Winston Crooke’s involvement in the Nevis Cycle and Triathlon Club, the St. Kitts-Nevis Cycling Federation and the St. Kitts-Nevis Triathlon Federation won him that award over Ms. Debbie Wallace. Realising the need to link the tourism product of Nevis with that of sister-island St. Kitts, the Two Islands, One Paradise Award was presented to Mr. Wincent Perkins for his sea taxi service. The Sea Bridge also vied for that award. The late Jim Johnson’s Pirate Week received the Value Added Initiative of the Year Award. “Pirate Week added value to the [tourism] industry by creating a reason for adventure seekers to travel to Nevis during [the] slowest times by giving travel writers good reason to keep Nevis in the press,” Mr. Phillip explained as he presented the award to Mr. Johnson’s wife on his behalf. The Golden Rock Hotel, for the upkeep of its property, captured the Most Significant Property Improvement Award over Rivere House and the Four Seasons Resort. The hotel’s General Manager Mrs. Pam Barry offered words of appreciation to the HTA while contractor Mr. Noral Lescott accepted the award. While the Oualie Beach Resort’s Ms. Wilma Johnson was commended for being the “driving force behind the morning staff,” it was Sous Chef at the Nisbet’s Plantation Beach Club Ms. Elsa Delashley who captured the award for Hotel and Tourism Supervisor of the Year. Ms. Delashley worked as an employee at Nisbet’s Plantation Beach Club for more than 20 years and was instrumental in the HTA’s Project Future Chef programme. Nevis’ newest restaurant, the Ole House Café won that award particularly because of its mix of Caribbean and international cuisine. The bank’s General Manager Mr. Everette Martin accepted the award. The St. Kitts Nevis Anguilla Trading and Development Company Limited [TDC] was the other nominee in the Business of the Year category. Nevis’ Premier and Minister of Tourism, the Honourable Joseph Parry provided remarks at the event and later distributed the awards to the winners.